'Get it' is one of Michael Jackson's lesser known duets. 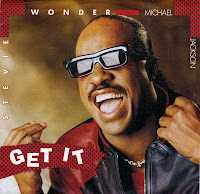 The track was taken from Stevie Wonder's album 'Characters' and released as its second single. Jackson worked with Wonder eight years earlier for the song 'I can't help it' for his album 'Off the wall', which was written by Wonder and former Supremes member Susaye Greene, while Wonder worked with Jackson on his top-selling 'Bad' album for the song 'Just good friends'. The song features Wonder and Jackson talking about how to treat a lady, alongside what does a woman wants, needs, and respect from her lover. The single reached number 80 in the US Billboard Hot 100 chart.